Daniel Mendoza (left) talks about his post-service plans with Dave Renfrew, corporate recruiter for YRC Freight, at the 2015 Washington State Service Member for Life Transition Summit at JBLM. Mendoza, who is scheduled for discharge from the U.S. Army in November, had recently earned his commercial driver’s license after being among the first JBLM soldiers to take part in the “Troops Into Transportation” program. Spec. 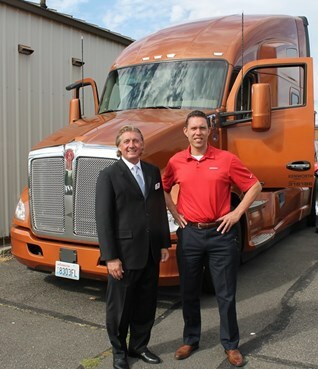 Kyle Wyche, who’s served as a medic for the past four years and has seven months of service left, said he also sees the T680’s comfortable interior offering a stress-free and worry-free environment. “It offers lots of space and it’s so comfortable I just wanna take it home.” Staff Sgt. 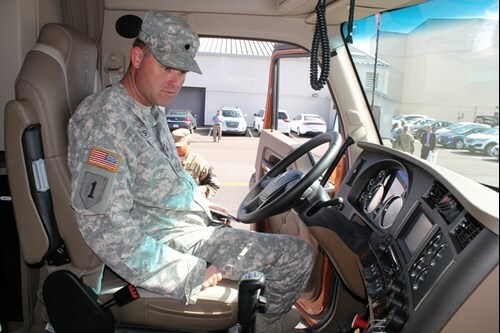 Richard Steele, who’s retiring after 20 years in the U.S. Army in 47 days and has been giving a second career in truck driving serious consideration, said he thinks the Kenworth T680 is “gorgeous.” If given a choice between two different companies offering jobs, if one provided a T680 and the other didn’t, all other things being equal, would he pick the company with the T680? “Absolutely!” Steele said with a grin. Thomas said he has had extensive experience fixing and rebuilding automotive engines since he was 18 and is dismayed at how complex and difficult they’ve become to service and repair. “If the MX-13 engine is any indication of the thought that goes into building diesel-powered truck engines, I could see myself becoming a diesel technician.” The soldiers saw the T680 on the third day of the three-day summit. The third day included employment seminars and panel discussions plus a hiring fair involving dozens of local and national employers and attracting more than 1,000 service members. The transition summit at JBLM is one of more than two dozen being held at military bases across the country and around the world. 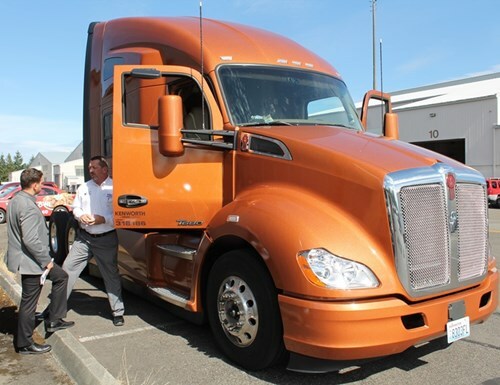 Jose Diaz and Carlos Rivera take a closer look at the spacious interior of the Kenworth T680 76-inch sleeper at the 2015 Washington State Service Member for Life Transition Summit at JBLM.